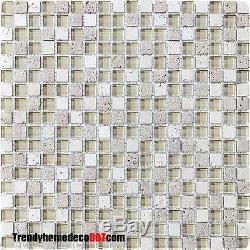 This beautiful 5/8 Grid design has a combination of Beige / Cream and Glass / Natural Stone. These tiles are mesh mounted and will bring a sleek and contemporary clean design to any room. This tile is well suited for kitchen backsplash, bathroom tile, fireplace, floor tile and more. Harmonious color result in unique pieces of art. Check out some of our other items! Check out some of our other categories! The item "10-SF cream Dune stone Glass Mosaic Tile kitchen backsplash wall bathroom shower" is in sale since Saturday, September 3, 2011.